July 11, 1908: Engineering Recordarticle. The Little River Water Supply for Springfield, Mass. “The present water supply of Springfield, Mass., is derived from the Ludlow Reservoir, and has for many years been the source of much trouble on account of the growth of anabaena during warm weather. Repeated investigations and reports had been made on the causes of the growth and the best means of rendering the water, as delivered in the city, free from objection, with the result that a decision was reached to abandon the Ludlow supply altogether and develop the Little River watershed, an entirely new source. While the construction of the new work is under way, the Ludlow Reservoir water is being rendered usable during the anabaena season by a temporary intermittent filter plant. The supply from the Little River is as good as other waters used in a raw state by Massachusetts cities, but in this case, in recognition of the advancing requirements of quality, it was decided to filter the water, and, accordingly, sand filters of a nominal capacity of 15,000,000 gal. per day will be built to filter the entire supply. The watershed will be developed in part only at the present time, as the run-off is far above the immediate needs of the city. The Little River is a branch of the Westfield River, and the catchment area is located almost directly west of Springfield, the intake dam being about 12~ miles from the city. From this dam the water will flow through a tunnel, not quite a mile long, cut through the rock under Cobble Mountain. 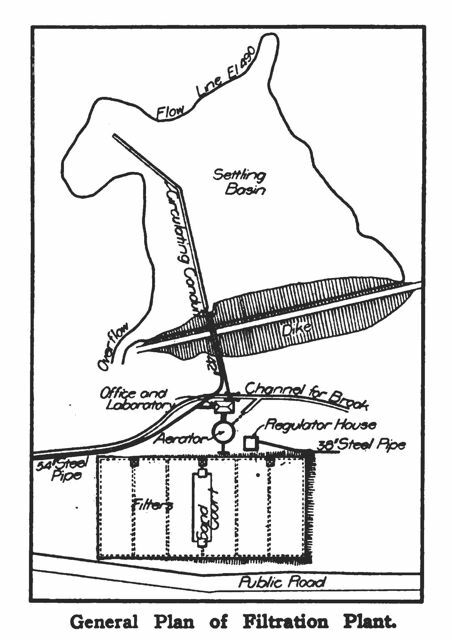 The sedimentation basin and the filtration plant will be located near the end of the tunnel and the pure water will flow through a steel pipe line a distance of 74 miles to a covered reservoir on Provin Mountain. Commentary: Stubborn opinions by sanitary experts in Massachusetts stalled the efforts for many years to install filtration on water supplies in the state. The prevailing view was that water supplies should only be taken from sources fully protected against contamination and that it was wrong to treat marginal or substandard water supplies. With the “recognition of the advancing requirements of quality” at least this Massachusetts city was able to insure the delivery of safe and palatable drinking water. This wrong-headed water supply viewpoint was promoted by Thomas Drown, William T. Sedgwick, George C. Whipple and other professors and graduates of Massachusetts Institute of Technology. In 1909, some of these same individuals testified against the first use of chlorine on the Jersey City water Supply at Boonton Reservoir. This entry was posted in Year 6 TDIWH and tagged filtration, Massachusetts, Springfield, water history, water supply on July 11, 2018 by safedrinkingwaterdotcom.